One of the most horrible scenarios one can experience in life, surely has to be being left at the altar. Not quite, but in essence, having one's impending wedding called off. This is what happened to Franz Wisner, a successful government press secretary and public relations executive. She didn't have a clear-cut reason and that wasn't the end of it - he was demoted at work too. What a nightmare. 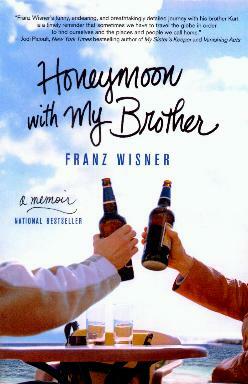 With wedding reservations in place (why cancel a party when most guests were coming anyway), Wisner and his brother Kurt, who were not close, decided to go on the honeymoon to Costa Rica. Why not? With great aplomb, Franz presents his account of his suddenly and unexpectedly upturned life. The brothers started their actual travels in Russia. This was after selling up and packing away everything back home in the States, and they ended up travelling for two years. With friends they could stay with in both Russia and the Czech Republic, they left behind what they knew and boldly headed off into the unknown with the promise of buying a Saab in Sweden for their journey through Europe. They visited and experienced Thailand, Vietnam, Cambodia, Bali, Syria, Brazil, Venezuela, Africa, and so much more. Not only experiencing the sights and foods, but often the people - a great way to see any country. He recalls thoughts and memories about days and years gone by - sometimes it's a moving picture, other times it's uplifting. Getting to know his brother on this trip was a great testing ground. There are also the letters he wrote to his 99-year-old grandmother back home. I anxiously awaited his trip to South Africa, and Africa, and thought his impressions accurate. A section every First World citizen should read and digest, is "This Poor Ole World of Ours", between chapters 25 and 26 - I live by this last paragraph. Conclusion - Very moving and interesting.